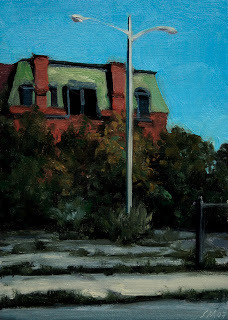 Detroit Blues 06, oil on linen panel, 7"x5"
The sixth in the Detroit Blues series of Detroit paintings. 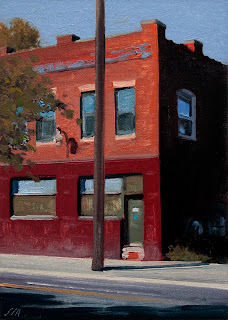 The sharp contrast of light and shadow really caught my eye on this little Detroit scene. This painting was done by my Aunt, Justine Magsig. 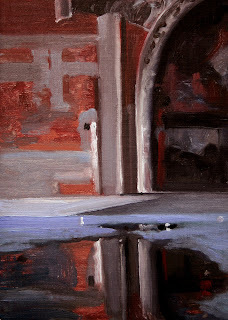 She has been inspired by my blog of daily paintings to take up the brush again. She is a terrific painter. 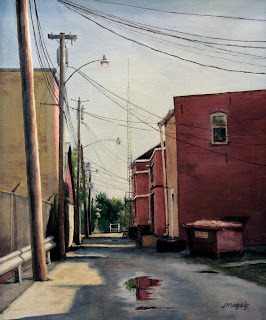 This alley is in the small town I grew up in. She gave me my first and only real fine art training when I was a ten year old farm kid. She helped inspire me to become an artist. Wonderful how the circle continues. She still lives on Sugar Creek with her husband Calvin. 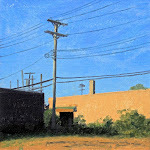 Brush Park 05, 5"x7", oil on linen/panel. 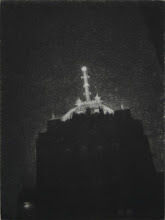 The fifth in this series. Parts of the Detroit Landscape have reverted back to nature, turning into an "Urban Prairie"
Detail of a column in the Michigan Palace Theatre. 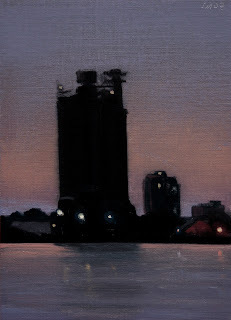 Detroit Nocturne #03, oil on linen?panel, 7"x5"
Nocturne along the Detroit River. 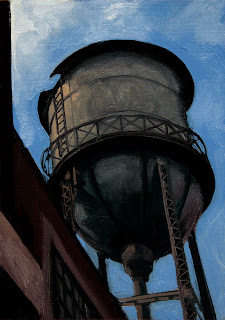 Russell Industrial Tank, oil on linen panel, 7"x5"
The Russell Industrial is a very large warehouse complex that has seen many lives, current owners are trying to make it artist friendly and many Detroit artists have studio space here. I shot this during an artist open house last month. 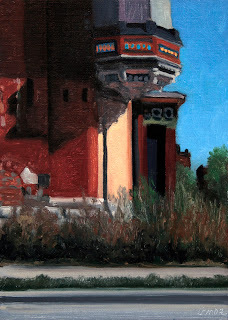 Michigan Palace Theatre, oil on linen panel, 7"X5"
This painting is in direct response to the talk about John Singer Sargent on the Daily Painters Discussion Group. 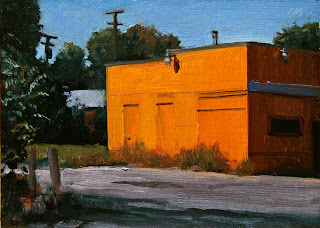 Brush Park 04, oil on linen panel, 7"x5"
Brush Park 03, oil on linen panel, 7"x5"
This is the third in the Brush Park series of paintings. This area of Detroit is so wild that I flushed out a couple of Pheasants while shooting photos for record and for reference. 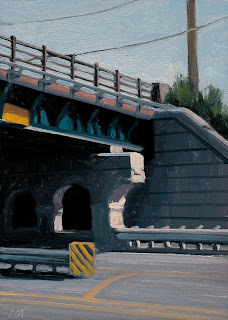 Brush Park 02, oil on linen panel, 7"x5"
This is the second in the Brush Park series of paintings. This building like many others in this area is in a state of flux. Just bidding time to see if it will be restored , hopefully, or destroyed. It has been in this state almost 20 years, I first took photos in this area in the mid-80's. They haven't changed much, some plywood to protect and keep people out. Just a lot less of them. 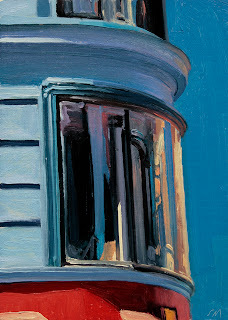 Storefront Shadows, oil on linen panel, 7"x5". 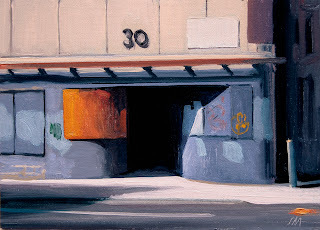 Another Detroit storefront that caught my eye, I really like the abstract shapes the shadows make. 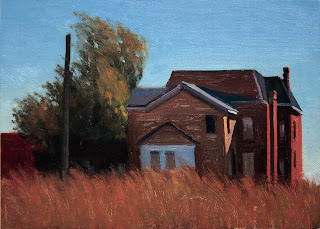 Brush Park 01, oil on linen panel, 7"x5"
This is the Brush Park area of Detroit. 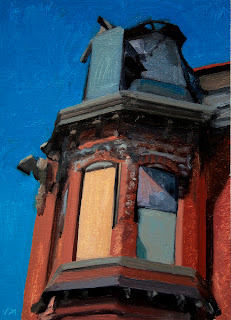 Once home to the wealthy, many of the buildings have deteriorated to almost ruins. New nondescript condo buildings are replacing these once elegant buildings. The area is very near the Detroit Sports arenas. Very sad to lose these gems, I am happy I can leave a visual record. 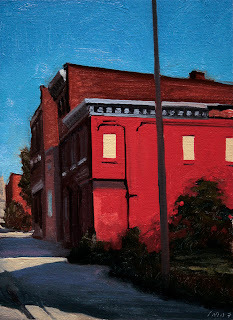 I plan on doing a series of paintings of Brush Park. 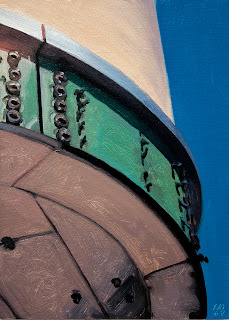 This is a painting of the United Artist Marquee, the building is still standing but the marquee is gone. I had a lot of fun doing this painting. 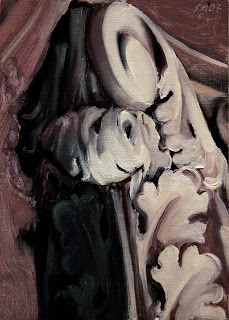 When I first decided to paint it I felt that it might be to simple to really challenge me. 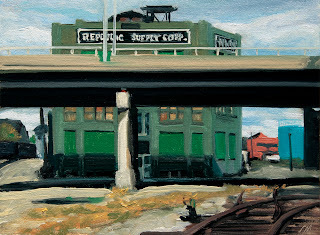 But the more I painted the more I saw and isn't it the artist's job to find more than is there? I was happy with the way it came out. 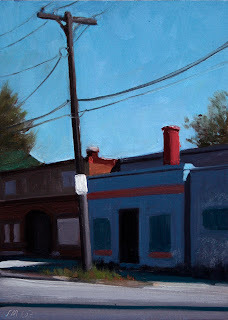 A lot of the fun of painting is the physical act of painting, the moving around of paint, the way paint gives the elusion of the actual object. It is why painters paint. 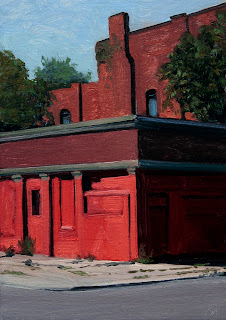 Fort St. Shadows, oil on linen panel, 8"x6"
Detroit Blues #05, oil on linen panel, 7"x5"
Detroit Blues 4, oil on linen panel 5"x7"
This is in the heart of downtown Detroit in Foxtown, named for the Fox Theatre in the area. Detroit vernacular at its best. 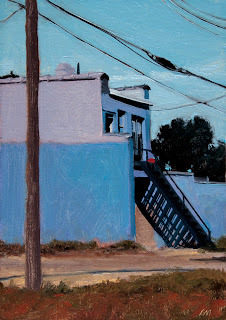 Woodward Ave. Corridor, oil on linen panel, 5"x7"
Shadows, oil on linen panel, 7"x5"
Midtown Blue, oil on linen panel, 7"x5"
I was really intrigued by the shadows created by the steps on this building. Finding beauty in everyday life. 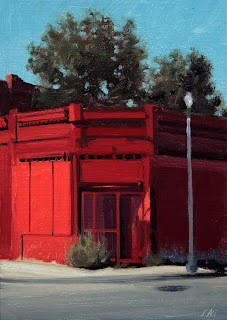 Downtown Red, oil on linen panel, 7"x5". 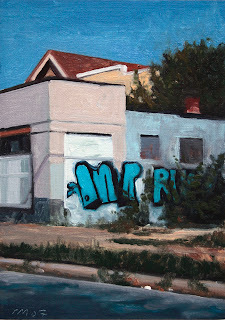 Detroit Blues 03, oil on linen panel, 7"x5"
I have been wanting to paint this for a long time. 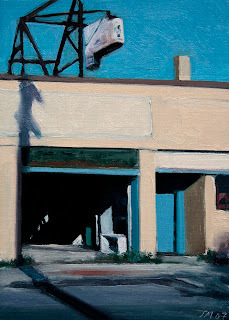 I shot it after visiting another artist's studio in dowtown Detroit. 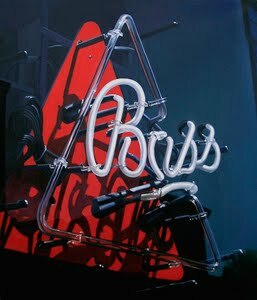 I may take this to a larger format for my gallery here. 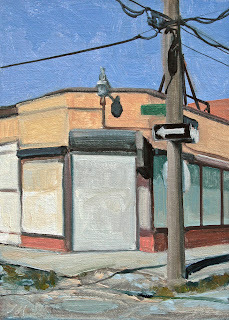 Corner Storefront #02, oil on linen panel, 7"x5"
Another interesting storefront in the vast neverland we call Detroit. 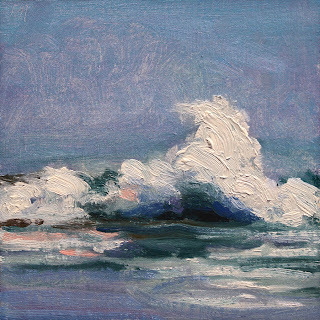 Pacific Coast Blue #06, oil on linen panel, 5"x5"
Because of all the hot weather here, I was in a California state of mind, so I did a Pacific Coast painting for a change of pace. 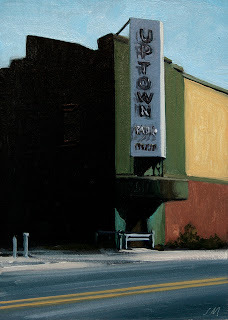 Uptown Radio, oil on linen panel, 7"x5". 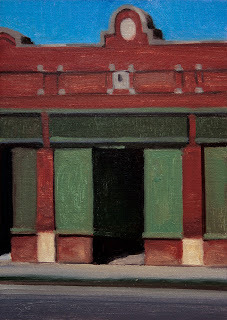 Another in a long line of Detroit vernacular no longer in existence. Demolished by neglect. Latest in the Postcards from Detroit scenes. 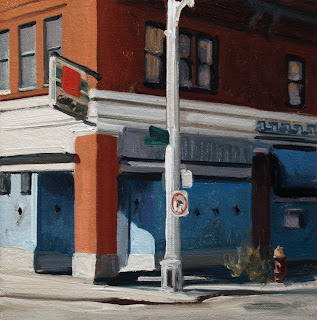 Detroit Blues Two, oil on linen panel, 5"x5"
Another little corner building in downtown Detroit. 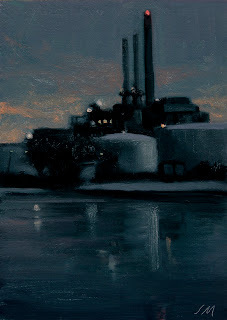 Nocturne in Blue & Grey #2, oil on linen panel, 7"x5"
Another nocturne of the downriver industrial area of Detroit. 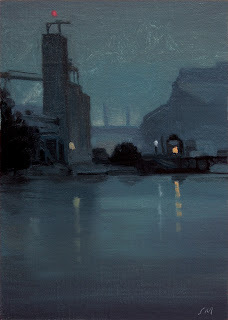 Nocturne in Blue & Grey, oil on linen panel, 7"X5"
The Detroit Lime Co. and the River Rouge Plant in the Bkg.